I have very fond memories every Fall of making my Auntie’s Persimmon Cookies with her. They are the perfect Holiday treat. Whenever the beautiful orange fruit would show up at the grocery store, we would go and carefully pick out the ones that were soft to the touch. Then we would take them home and wait for them to ripen. Auntie’s Persimmon Cookies are deliciously moist, with the wonderful flavor of cinnamon spice. The Holiday Season wouldn’t be complete without this old family favorite recipe. 2. Line a baking sheet with a Non-Stick Baking Mat or parchment paper. 3. In a small bowl, mash the persimmon pulp and stir in the baking soda, the mixture will congeal. 5. In a large bowl, cream together the butter and the sugar until it is light and fluffy. 6. Stir together the flour, salt, cinnamon, cloves and nutmeg in a medium bowl. 7. Add the egg to the persimmon/soda mixture and mix well. 8. Add the pulp and flour mixtures to the sugar and butter and combine well. 9. Add the nuts and raisins. 10. Using a medium cookie scoop, drop by spoonful onto the greased cookie sheet. 11. Bake for 13-15 minutes or until slightly browned and puffy. 13. For Maple Glaze: in a medium bowl, mix all ingredients together until smooth. 14. Place a sheet of parchment paper under the wire rack to catch the drips and drizzle the glaze using a spoon onto the cookie tops. 15. Let set until glaze hardens. 16. For White Chocolate frosting: Using kitchen scissors cut the green belt candy into small leaf shapes. 17. Place white chocolate and Crisco into a small microwave safe bowl and microwave on high for 1 minute. 19. 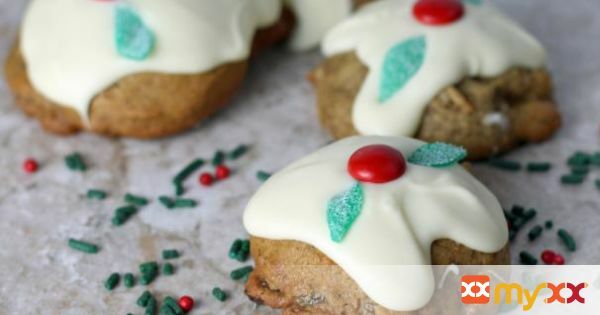 Place a sheet of parchment paper under the wire rack and using a spoon, drip some frosting onto the tops of the cookie. 20. Place one red M&Ms on the top and then add the green belt leaf to each side. 21. Let set until frosting hardens.